Call 415-854-3282 or email to become a client. With their sub-$400 prices, the new headsets could expand the market and stimulate demand for VR headsets. This research analyzes the impact of the impending release of a major new VR headset platform. Already a Subscriber? Login Now. 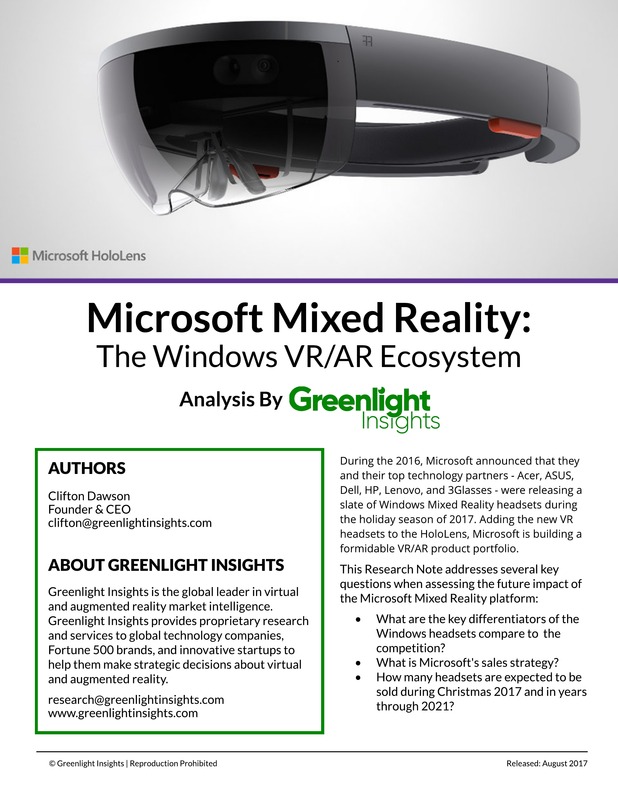 During the 2016, Microsoft announced that they and their top technology partners - Acer, ASUS, Dell, HP, Lenovo, and 3Glasses - were releasing a slate of Windows Mixed Reality headsets during the holiday season of 2017. Adding the new VR headsets to the HoloLens, Microsoft is building a formidable VR/AR product portfolio. What are the key differentiators of the Windows headsets compare to the competition? What is Microsoft's sales strategy? How many headsets are expected to be sold during Christmas 2017 and in years through 2021? Plus, members receive PDF copies of reports covering industry trends, access to proprietary databases, and full-access to our senior analysts. Greenlight Insights is the global leader in virtual and augmented reality market intelligence.